Speweik Preservation Consultants were commissioned to create, design, and implement an onsite training program that met with the requirements of the new ASTM E2659-18 Standard. 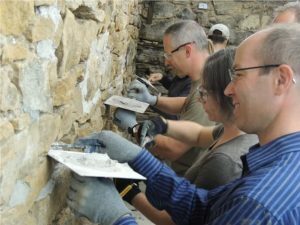 The training involved working with the masons, architect, building owners and general contractor as well as the state historic preservation office to ensure all stone treatments complied with the Secretary of the Interior’s Standard for Rehabilitation. This entry was posted by John Speweik on Wednesday, January 26th, 2011 at 11:42 pm	and is filed under Video. You can follow any responses to this entry through the RSS 2.0 feed. Responses are currently closed, but you can trackback from your own site.